Batley Boys opened their Yorkshire Men’s League Premier Division campaign with an impressive 40-12 victory away to Queensbury last Saturday. The Boys returned victorious thanks largely to a man-of-the-match performance from prop forward Matthew Sheridan, who was impressive throughout. Batley opened the scoring when good work from Gav Davies, Mike Mold, Aaron Briggs and Aaron Kirk created the chance for Sheridan to cross and the Boys added a second try as a wonderful break by Josh Knowles was supported by Kirk. William Brook was on the end of another excellent Boys move to score a try in the corner before Batley defended a 24 tackle stint on their own try line as Knowles, Davies, Sheridan and Kirk led the way. The pressure eventually told as Queensbury got over for try to reduce the deficit to 16-6. 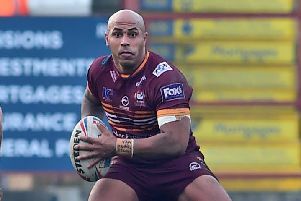 Batley started the second half strongly as Jay Jay Price claimed two tries in quick succession with Brook adding two more to complete his hat-trick before Queensbury hit back. Adam Bingham ensured Batley would be victorious on their Yorkshire Men’s League bow when he scored the final try. MoM was Sheridan, closely followed by Knowles and Brook and the Boys welcome Doncaster Toll Bar to Halifax Road this Saturday (ko 2.30pm). Toll Bar started their campaign with a 46-0 win against Sharlston last week.